VIZIO is coming out with one after other high quality speaker systems with attractive price tags. 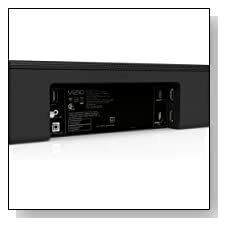 With the latest model VIZIO SB4051-C0, the company brings impressive specification at slightly competitive price. This 5.1 channel surround sound home theater speaker system comes with a 40 inch sound bar, two bookshelf speakers and a powerful wireless subwoofer. With many options out there, this new speaker system will have to do something magical to rise above its revels. Through this detailed VIZIO SB4051-C0 review let’s find out if it actually can. Powerful 102 dB sound which will fill the room with loud and clear sound. Wireless satellite speakers and subwoofer for mess free connectivity. Amazing 5.1 true surround sound effect. Built-in Bluetooth technology to stream music from smartphones. Powered by Dolby Digital, DTS digital surround, Circle sound and Studio sound technologies. The model somehow has got the WOW factor in aesthetics. The first thing you notice about VIZIO SB4051-C0 is its premium look. These speaker units look stunning and very expensive – which is good to boost your social status, its all-metal grills design also feels superior and durable. We give this model full mark for its design and built-quality. The speakers weighs less but doesn’t rattle at high volumes. 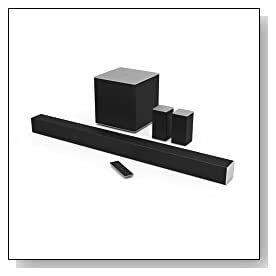 This VIZIO speaker supports HDMI input and 3.5mm aux input apart from wireless Bluetooth connectivity. Coming back to important part of the review, the sound quality of the speaker system up to the mark. The SB4051-C0 is filled with latest technologies to bring incredible audio experience. The model is powered with DTS Digital Surround, DTS Studio Sound, DTS Circle sound, Dolby Digital and aptX technology. Surround sound effect on this speaker system was truly incredible. VIZIO guarantees less than 1% of harmonic distortion in this model. We didn’t notice any distortion whatsoever with our review unit. Final verdict, this speaker system really does good job in offering good surround sound effect. Considering the price tag and latest sound processing technologies under-the-hood, we feel VIZIO SB4051-C0 is obviously a better choice for high-end home theater system. If you’re dreaming about owing a good quality surround sound speakers for a long time, we feel your search ends with this model. This model will surely satisfy the needs without putting a hole on pocket.